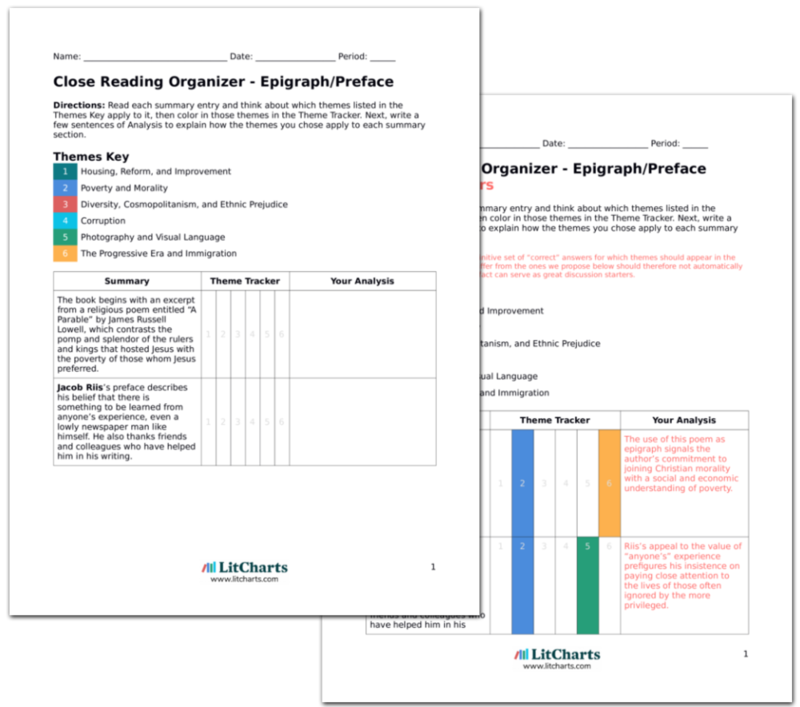 Instant downloads of all 942 LitChart PDFs (including How the Other Half Lives). 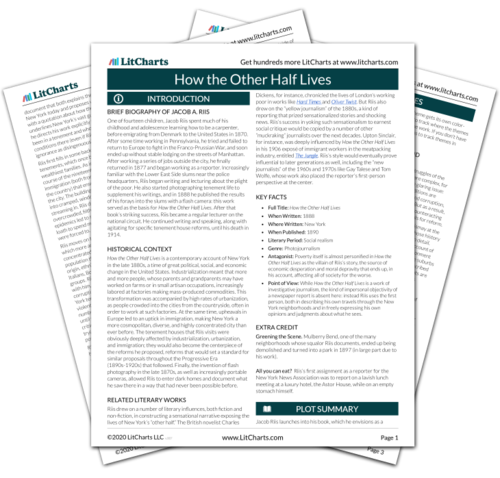 Welcome to the LitCharts study guide on Jacob A. Riis's How the Other Half Lives. Created by the original team behind SparkNotes, LitCharts are the world's best literature guides. A concise biography of Jacob A. Riis plus historical and literary context for How the Other Half Lives. A quick-reference summary: How the Other Half Lives on a single page. In-depth summary and analysis of every chapter of How the Other Half Lives. Visual theme-tracking, too. Explanations, analysis, and visualizations of How the Other Half Lives's themes. How the Other Half Lives's important quotes, sortable by theme, character, or chapter. Description, analysis, and timelines for How the Other Half Lives's characters. Explanations of How the Other Half Lives's symbols, and tracking of where they appear. An interactive data visualization of How the Other Half Lives's plot and themes. One of fourteen children, Jacob Riis spent much of his childhood and adolescence learning how to be a carpenter, before emigrating from Denmark to the United States in 1870. After some time working in Pennsylvania, he tried and failed to return to Europe to fight in the Franco-Prussian War, and soon ended up without stable lodging on the streets of Manhattan. After working a series of jobs outside the city, he finally returned in 1877 and began working as a reporter. Increasingly familiar with the Lower East Side slums near the police headquarters, Riis began writing and lecturing about the plight of the poor. He also started photographing tenement life to supplement his writings, and in 1888 he published the results of his forays into the slums with a flash camera: this work served as the basis for How the Other Half Lives. After that book’s striking success, Riis became a regular lecturer on the national circuit. He continued writing and speaking, along with agitating for specific tenement house reforms, until his death in 1914. 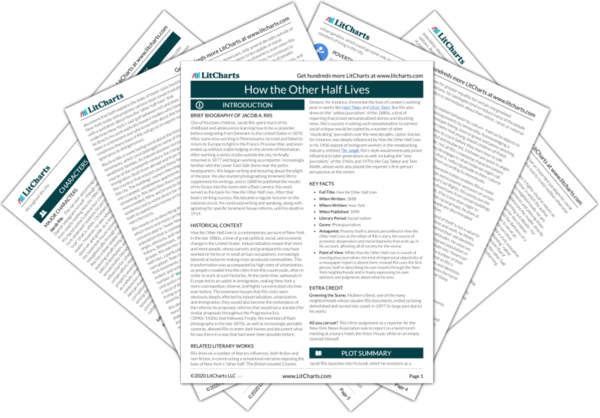 Get the entire How the Other Half Lives LitChart as a printable PDF. How the Other Half Lives is a contemporary account of New York in the late 1880s, a time of great political, social, and economic change in the United States. Industrialization meant that more and more people, whose parents and grandparents may have worked on farms or in small artisan occupations, increasingly labored at factories making mass-produced commodities. This transformation was accompanied by high rates of urbanization, as people crowded into the cities from the countryside, often in order to work at such factories. At the same time, upheavals in Europe led to an uptick in immigration, making New York a more cosmopolitan, diverse, and highly concentrated city than ever before. The tenement houses that Riis visits were obviously deeply affected by industrialization, urbanization, and immigration; they would also become the centerpiece of the reforms he proposed, reforms that would set a standard for similar proposals throughout the Progressive Era (1890s-1920s) that followed. Finally, the invention of flash photography in the late 1870s, as well as increasingly portable cameras, allowed Riis to enter dark homes and document what he saw there in a way that had never been possible before. Riis drew on a number of literary influences, both fiction and non-fiction, in constructing a sensational narrative exposing the lives of New York’s “other half.” The British novelist Charles Dickens, for instance, chronicled the lives of London’s working poor in works like Hard Times and Oliver Twist. But Riis also drew on the “yellow journalism” of the 1880s, a kind of reporting that prized sensationalized stories and shocking news. Riis’s success in yoking such sensationalism to earnest social critique would be copied by a number of other “muckraking” journalists over the next decades. Upton Sinclair, for instance, was deeply influenced by How the Other Half Lives in his 1906 exposé of immigrant workers in the meatpacking industry, entitled The Jungle. Riis’s style would eventually prove influential to later generations as well, including the “new journalists” of the 1960s and 1970s like Gay Talese and Tom Wolfe, whose work also placed the reporter’s first-person perspective at the center. Antagonist: Poverty itself is almost personified in How the Other Half Lives as the villain of Riis’s story, the source of economic desperation and moral depravity that ends up, in his account, affecting all of society for the worse. Point of View: While How the Other Half Lives is a work of investigative journalism, the kind of impersonal objectivity of a newspaper report is absent here: instead Riis uses the first person, both in describing his own travels through the New York neighborhoods and in freely expressing his own opinions and judgments about what he sees. Greening the Scene. Mulberry Bend, one of the many neighborhoods whose squalor Riis documents, ended up being demolished and turned into a park in 1897 (in large part due to his work). All you can eat? Riis’s first assignment as a reporter for the New York News Association was to report on a lavish lunch meeting at a luxury hotel, the Astor House, while on an empty stomach himself. Baena, Victoria. "How the Other Half Lives." LitCharts. LitCharts LLC, 24 Jan 2018. Web. 20 Apr 2019. Baena, Victoria. "How the Other Half Lives." LitCharts LLC, January 24, 2018. Retrieved April 20, 2019. https://www.litcharts.com/lit/how-the-other-half-lives.